Clifton Chase is the latest target for bully Ryan Rivales. But after he finds a mysterious arrow in his closet, he takes Ryan’s bet to see who can hit the target. Ryan nails the bulls-eye, but Clifton’s piece of junk arrow sails out of sight and when he finally finds it, something isn’t right. Somehow, Clifton has been magically transported back to 1485 England, where he meets two princes bullied by their tyrant uncle who locked them in prison to steal their throne. Only after Clifton learns the true meaning of friendship, bravery, and sacrifice can he help the princes escape and find the courage to face his own bully. Befriended by a dwarf, a mythical bird called Simurgh, and a cast of comical characters, Clifton’s fantasy adventure through medieval times is perfect for boys and girls of all ages, and the young at heart. For those who like fantasy kids books like Percy Jackson and Harry Potter. I would have to agree with her about that. 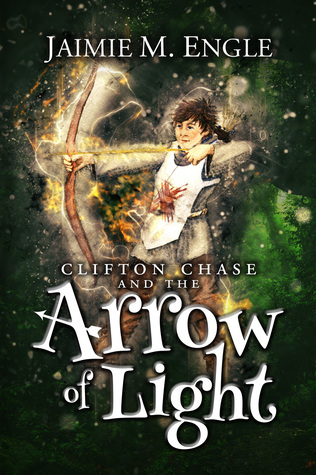 Clifton Chase and the Arrow of Light was a book that I loved reading. Wonderfully written, I was taken on a journey of self-discovery and courage and Clifton realizes his worth and gets the courage to do what is right. I will admit that Clifton was a little bratty at the beginning of the book. To be honest, I thought his first interactions with Ryan were more about jealousy than being bullied and he started to annoy me….big time. But the more I read, the more I started to understand that Ryan was being a bully and my annoyance with Clifton started to fade. By the time I got to the part of the book where Clifton’s parents were making him write an apology letter to the coach and Ryan, my annoyance faded and I felt bad for him. I thought that the historical fantasy part of the book was fantastic. From the minute Clifton landed in 1485 England and met Dane, I was entranced. There were dwarves, dragons, sea monsters, mermaids, a magical arrow and a magical bird who has a human face. Add in that it takes place in 1485 England with real historical people, places, and events and I couldn’t get enough of it. I did have a small complaint about the modern language that Clifton used with talking to Prince Edward, Prince Richard, and Lady Elizabeth. But, then I thought about it a bit and how was he supposed to talk. He was a visitor sent back in time….how was he supposed to talk? So my little complaint ended shortly after I had that thought. The growth of Clifton in the book was great. He went from being an insecure little boy who didn’t know how to deal with a bully to a confident young man who had the wisdom to know when to walk away from his bully. While the transformation was gradual, it really showed at the end of the book with the choices that Clifton made both in his life in Melbourne, Florida and in 1485 England. Speaking of the end of the book, I really liked it and I also liked that the author chose to leave it with the possibility that there could be a book 2. Which I hope there is because I can’t wait to see what adventures Clifton will go on next. Why: This is a book that I would feel very comfortable letting both my 9-year-old and 11-year-old read. It has a great plot line with relatable characters. Why: mild violence but otherwise a very clean book. I will add a trigger warning because of the bullying scenes. This looks and sounds like a great book with a great moral. My tween would love it.